Was born in 1946 in village Ekaterinovka, the Rostov area, Sal'sky area. Member of the Union of Artists of Russia, the deserved art worker of Republic of Komi. Lives in Syktyvkar. Without any exaggeration I declare: Gennady Dmitriev - the remarkable Russian artist. 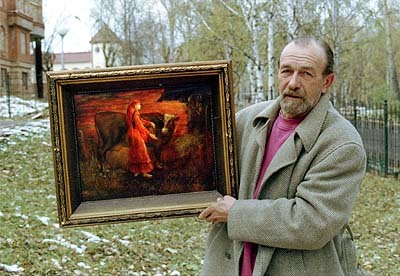 He keeps and develops traditions of classical Russian painting, remaining thus completely modern. How it is possible to him? Culture. High culture in all. In big and trivialities. And however trivialities in art are not present. And still morals which was always inherent in Russian artists. But without any edifications. First of all, Dmitriev - the master of color. At him the good school, fine drawing, but color is his strength. He sees more. Therefore and canvases at him always rich and refined. Sometimes, however, he balances on the verge of allowable. But it only gives an acuteness as the feeling of a measure to him seldom changes. Dmitriev's Painting very material. He is attentive to the technological side of process. The colourful layer, a ground, a canvas, a frame - nothing remains without attention. In my representation materialized art also should be such. And still. Gennady - wide nature. The Don cossack. His kindness will suffice on all. And to walk - so to walk. The truth years. All told, this my subjective opinion. Certainly biassed.